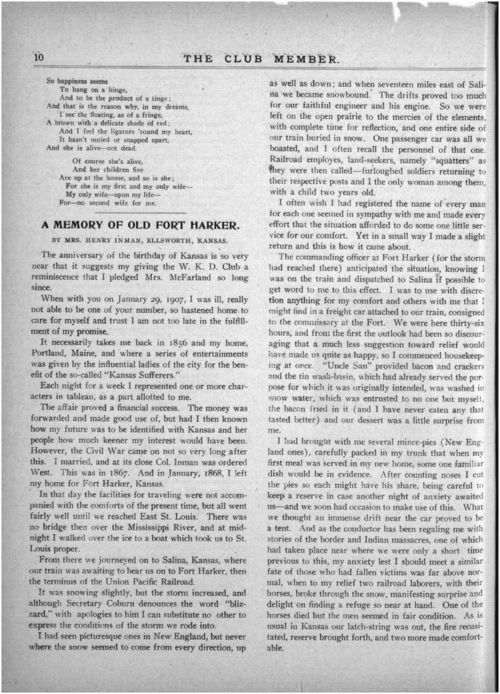 This reminiscence by Mrs. Henry Inman, published in The Club Member, describes her experiences as a Kansas pioneer. She moved to Fort Harker in January 1868 after a difficult journey in severe winter weather. She details various aspects of frontier life, including the U.S. military's conflicts with Native Americans and the daily struggle for survival. She also mentions how she met "Mother" Bickerdyke, and that her husband served in the Seventh Cavalry under General George Armstrong Custer. This entertaining source describes what daily life in a fort was like. It provides balance to this standard by presenting a female perspective on life in a Kansas fort.